Welcome to www.worthingpubs.com, dedicated to researching the history of our local pubs. This study is ongoing and we welcome contributions, stories, pictures etc that will expand our knowledge and bring back memories of times past. We know that a beer house existed in 1840 attached to a lodge house in Heene Road and that up until the 60s, the words Sportsman's Inn was still visible on the building. The address at that time was number 94. 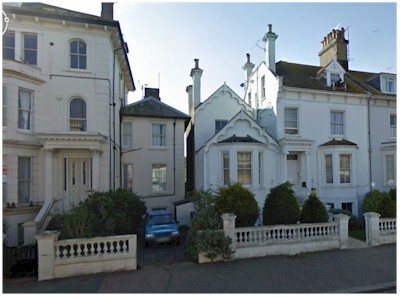 However, due to redevelopment, I'm sure it is/was now out of position and not the present building at 94 Heene Road. Two possible contenders for the Sportsman Beer House. Both on the east side of the road - both at the south end - both villa types, but neither close enough to the sea. Each has an 'attached' building that could have served as a beer shop. Heene Road has lost a lot of its original large villas and much house renumbering has followed suit.